I find smart home technology fascinating. There are really so many ways in which smart home tech is becoming applicable whether for saving energy, added convenience, or security. When I heard about the BeON Home Protection System I was intrigued for a few reasons. I am amazed that they took an everyday home item, a light bulb, and turned it in to a smart light bulb that provides multiple smart home safety solutions and proactive home security functions. BeON Home Protection System did provide me with a sample in order to facilitate review. I did not receive monetary compensation and the opinions expressed are my own. I love the capabilities of the BeON Home Protection System but what sealed the deal for me was that it has multiple practical uses. The BeON home protection system transcends the smart bulb category. It is not just energy efficient, it offers a new approach to home security and home safety as well. The BeOn Smart LED bulbs use smart modules, hidden inside each bulb. You just slide the smart module into the bulb and place in normal lighting fixtures around your house. 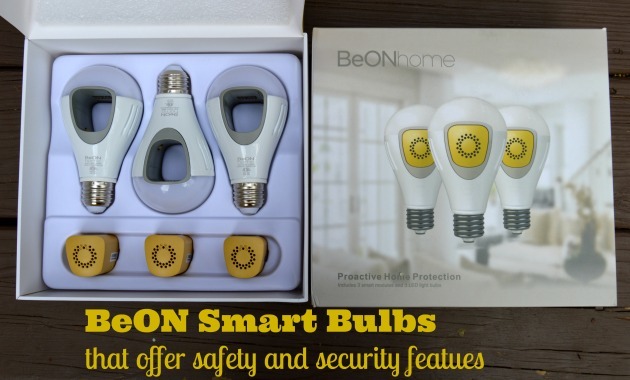 The BeON home protection system comes as a set of 3 bulbs (that will last about 22 years!) so that you can use the lights to create an emergency exit pathway. The BeOn smart LED bulbs function as normal lights but serve additional safety and security features. The bulbs can work in conjunction with a free mobile app for Android or iOS to deliver personalized smart home technology. BeON provides light when you need it most! In case of emergency, BeON LED bulbs are triggered by a fire alarm (or CO alarm) to light your path to safety. They also provide four hours of backup light during a power outage. Those are two huge smart home safety features that could prove invaluable if you are ever faced with the unexpected. Additionally, there is a “Welcome Home” feature in the app that allows you to illuminate your house with one touch so your pathway in will be safely lit. Burglars always target unoccupied homes. Use BeON LED bulbs to keep them away by mimicking your presence! BeON smart bulbs can learn and replicate lighting behaviors to create the illusion of home occupancy. They can even listen for the doorbell and respond by playing lights to make it look like you are home and moving around throughout the home! If you are thinking it sounds too complicated, don’t worry, it is not complicated. There is a 7-day auto learning period, no programming required. “BeON is the most effective means of using lighting to prevent home break-ins while you’re away. While timers and motion-activated lighting are a good start, they are too obvious to home intruders. BeON takes it to a whole new level and is much more convincing,” says Deputy Sheriff Dennis Harris. I found it super easy to use BeON. I just screwed the bulbs into a few lighting areas that serve the dual purposed of lighting our exit and being able to be seen from the outside of the home too. Then I just downloaded the app and watched a couple of apps in the video to show me how to get it connected and activate the features I wanted. BeON unites prevention with protection to give you peace of mind when you are away and lets you feel safe and sound when you are home. BeON has created a system that anyone can use in any home for simple safety lighting in emergency and power outage situations and simple proactive home security. Which features of the BeON Home Protection System appeal to you the most? Where would you put your BeON Bulbs? The fire exit lighting is awesome! I like that the bulbs have a built in battery. Burglars always target unoccupied homes. Use BeON LED bulbs to keep them away by mimicking your presence. I love the feature that the BeON LED bulbs makes it look like I’m always home at night and it deters break ins! I like that there is lighting in an emergency and it doesn’t need a hub. Favorite? BeON LED bulbs for four hours of backup light in an outage and to light your path to safety during a fire alarm. The bulbs that have built in batteries are so efficient, thank you so much for this! Hours of back up light! Living in Florida during hurricane season our power goes out alot. This would give me piece of mind! Wow this is are neat! My favorite feature is that is mimics your light patterns as if you were home! I would have a great peace of mind when going out of town! I really like the feature to make it look like I’m home – awesome protection feature. L love the fact self charging batteries ready for power outage and can last 22 years. My favorite feature is the way it mimics my lighting patterns in a non-robotic way. My home has been burglarized 3 times…maybe this would discourage these scum bags! Do I sound a bit bitter? They should go out and get a job, instead of stealing the things I work hard for! I like that it turns on lights when there is a power outage. I like that it mimicks lighting patterns in a “natural and believable manner” when I’m not home to make people think someone is home. These are quite nice, I like the Slow fade feature! Such a neat idea! I like that the lights learn your lighting schedule and replay it when you’re away! My favorite feature is the emergency lights. I like that they have a built in battery. I like the fact that they are a multi-use product, and all of them geared to protection and functionality. I love the back up lighting feature! I like the Relay Lights. My favorite feature it that it provides more than 5 hours of light during power outages & that you can turn lights on with your phone. I like the in app programming and control features. Easy use! Wow…what an amazing invention!!! I love how these lights mimick if someone is home when someone isn’t! I love that emergency lighting comes on when power goes out! I like the idea of emergency backup. We lose power a few times a year, so this would come in handy, especially during night outages and particularly around our stairways. I like that you get over 5 hours of light during power outages! The fact that it has a built-in battery is so smart! A common tactic of burglars is to ring the doorbell to see if anyone answers. I like the BeOn feature that turns on a light when the doorbell rings. My favorite feature is BeON Home protects your family while you’re home with backup light during a power outage and instant-on emergency lighting during a fire alarm. I like that these provide emergency lighting when you are at home. My favorite feature is the built-in battery. I love the emergency lighting. We get a lot of summer time storms here! I love that the bulbs are LED. Thanks so much for the chances to win. I love both the feature that the light turns on when the doorbell is on, which is more realistic than just having lights on a timer, and the fact that the lights can be used when the power goes out, which happens during summer storms and other times of the years, so this is just very practical. I love that it has a backup light during a power outage and instant-on emergency lighting during a fire alarm and CO2 alarms. Even when the lights are off! Very cool! I like that they will provide 4 hours of light during power outages and they will last 22 years. My favorite feature is the power outage lighting. How handy would that be! Instant lighting during smoke alarms? Excellent! I like that it mimics my lighting patterns when we are away from home. —> backup light during a power outage and instant-on emergency lighting during a fire alarm.